Glasgow University Library Special Collections has a considerable holding of eighteenth and nineteenth-century broadsheets and chapbooks (pamphlet-type publications) featuring crime and criminals. The most common are accounts of executions, and a few of these are reproduced here. The earliest form of 'hanging ballad' goes back at least to Tudor times. 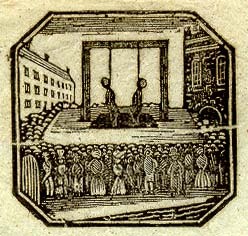 Public executions attracted large crowds, and ballad singers would canvass them, singing accounts of the crime and the behaviour of the condemned. Printed, single-sheet versions of the ballads were also sold by the singers, and had a wide circulation: they were carried into further parts of the country by pedlars. By the eighteenth century, this type of publication was one of the few pieces of non-religious reading available to the poor. Louis James in English Popular Literature 1819-1851 (Columbia University Press 1976), p. 38-9, describes the growth of presses producing this kind of work, and notes that by the end of the eighteenth century, every provincial town had its printer of broadsheets and chapbooks. Glasgow's specialist was John Muir, whose broadsheets are the ones which feature most prominently in the Special Collections. There was a problem with this kind of literature in Scotland, in that the number of criminals executed in the whole country was insignificant compared with the heavy use made of the gallows in England. Muir's publications collected information from all over Scotland, and also featured reports of English crimes as well. The GUL collection includes productions by English as well as Scottish printers, and a notorious crime, such as the murder of Maria Marten in the Red Barn (also the subject of a popular melodrama), sold well everywhere. By the late eighteenth century the broadsheets seem to have settled into a durable format which was adopted on both sides of the border: an account of the crime, a report of the behaviour and the - usually repentant - last words of the condemned. The ballad tradition survived in concluding verses, often attributed to the condemned. The nineteenth-century broadsheets were sold in the streets for a penny. The printers did make some effort to report the individual circumstances of each crime and the trial, often cribbing information from local reports, but the last dying speeches, verses, etc. were written to a formula, and helped to give this sensational literature the gloss of a 'moral' message. In some cases, the printers used the same dying words for several criminals, with a few minor amendments. During the nineteenth century the London-based broadsheets became more elaborate, and featured grisly woodcuts of the crime. Muir's Scottish publications did not run to this extravagance, but often featured a traditional and frequently reproduced woodcut of bodies hanging on the gallows. The Special Collections broadsides are scattered throughout the various collections, but holdings are particularly strong in the Ephemera, Murray and Wylie Collections. Type "broadsides" in as a subject search in the main Library catalogue to call up a complete listing of broadsides (NB. please note - records for the Ephemera Collection have not yet been added to the main Library Catalogue, but sheaf binders listing the collection in subject order are available in the Special Collections Department: please contact Julie Gardham for further information).